We are specialists in the service and installation of electrical systems. Whether it’s a residential, commercial or industrial systems or electrical work for a new construction, remodel and maintenance, we have a comprehensive knowledge of new technologies, as well as established systems. Gard Electrical Contracting was started by Robert Gard fifteen years ago as there was a shortage of employment opportunities. However, within ninety days of beginning operations, he found himself working seven days a week and needing to hire employees. Fast forward to 2018, and we now have multiple employees, four service vans, and a bucket truck to tackle any work. We service the areas of Denver, Aurora, Commerce City, Thornton, Westminster, Arvada, Lakewood, Englewood, Golden, Morrison, Littleton, Centennial, Parker, Lone Tree, Highlands Ranch, Castle Pines, The Pinery, and Broomfield and are open from 7 am to 5 pm, Monday through Friday. Around seventy percent of our business comes from servicing the residential market, making us well suited for any residential needs. However, what makes us second to none is our diverse employee base that allows us to tackle most, if not all, types of jobs that come our way. Our ability to deliver what we promise, complete jobs on time and back up what we sell sets us apart from the rest of our competitors. We design, build and install electrical services for any electrical system required in a home, commercial building or industrial facility. We also offer emergency services and free estimates whenever electrical equipment needs servicing. Our dream for the future is to continue to grow and hire more people to service the growing demand for our services. Through our work, we strive to promote green initiatives by encouraging the use of LED lighting products. As a business, apart from using LED lights, we try to minimize our carbon footprint by cutting down our usage of paper and ink. For all that we receive, we give back to society by working with Habitat for Humanity, Rebuilding Together Metro Denver and Arapahoe County Weatherization. We give these organization huge discounts, as they all do charitable work for low-income people. We also offer discounts to churches for work that we do. Along with discounts, we donate on a monthly basis to Colorado Christian Services (adoption agency) and the Mountain States Children Home (a troubled teens home). 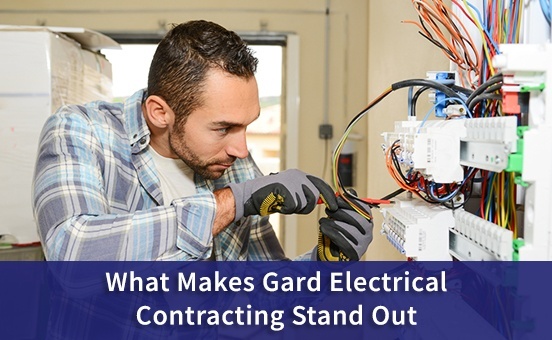 To learn more about all that we do at Gard Electrical Contracting, please click here. If you have any questions about how we can help you, we’d love to hear from you. Please contact us here.